The Knowth mace-head was found in a passage tomb at Knowth in the Boyne Valley ,County Meath Ireland. The original mace-head was made of flint from the Orkney Islands and is thought to have been attached to a wooden shaft mounted through the hole ,visible in the head. This artefact has a haunting beauty and is very advanced in its style of manufacturing for the neolithic period. It is embellished with perfect symetrical patterns on all surfaces and could have been used as a ceremonial hammer or mace. Colm Mc Cann of Killyliss Studio has designed this pendant to capture the exqusite beauty of this priceless artefact. The pendant is attached to a lenght of thong by a triangular bail and is 45mm x 33mm x 5mm in size. It is available on three finishes , coldcast brass,bronze and pewter. Please look at the image below to see the different finishes available. The main image is brass in finish. Please specify which finish you require when ordering. 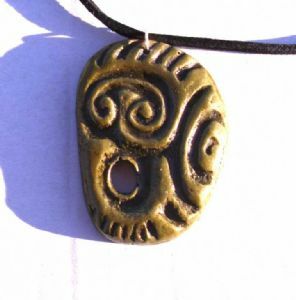 This handmade Irish pendant makes a beautiful gift for anyone interested in linking to their celtic past .